This article was originally posted on Let's Roll and is reproduced here for the purpose of keeping my blog up-to-date and active. The original can be found @ http://letsrollforums.com/showpost.php?p=189475&postcount=13. I've reviewed the "David receives his honorary doctorate" image and identified other issues with it, consistent with it also being another genuine picture of David Angell that has been altered in order to change his appearance. 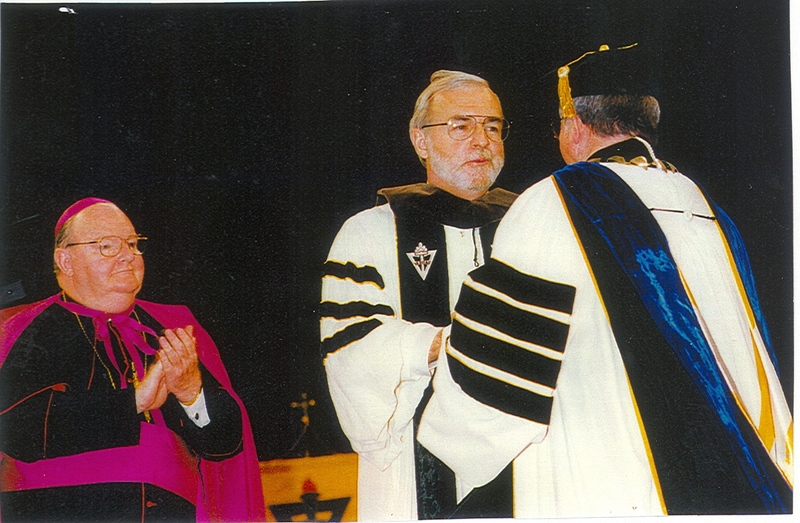 Just as his Emmy Award picture matches the 1984 Emmy Award video, this image tallies with David's biography and his being awarded an honorary doctorate by his alma mater, Providence College, in 1994. The fact that the Angell Foundation appears to be altering genuine pictures of David suggests that David Angell is still alive: by placing false pictures of David into the public domain the Foundation is obviously playing its part to ensure that David goes unrecognised under whatever name he now uses. Why else would the Foundation seek to mislead us, given that we know that David Angell was a real person rather than an outright 'vicsim'? In my view, it seems reasonable to assume that the alterations being made to these images are relatively subtle. In saying this, I'm referring not to the quality of the alterations per se (some are truly awful) but to the new facial characteristics themselves. If these alterations were too drastic they might arouse suspicion among those who knew him in real life. As things stand, one assumes that former friends and colleagues have no reason to scour the internet for pictures of their supposedly deceased friend and colleague; no doubt they have plenty of their own. Still, erring on the side of caution, it would be better to produce images that resemble David - on a bad day - rather than images that look nothing at all like him. The alternative is that these images have been manipulated to such an extent that they no longer bear any resemblance to the real David Angell. However, this would suggest that a multitude of friends, colleagues, and other Hollywood insiders are fully aware of, and playing along with, the deception. In this context, a cloud of suspicion hangs over Stephen Rollins, for the reasons stated in my previous post, and Ken Levine, who issues an annual tribute to David and Lynn that contains the below image. Peter Casey and David Lee, who occasionally pop up on Levine's blog, would also have to be added to the list in my opinion. While we're about it, we might as well add the rest of the cast and crew of Cheers, Wings and Frasier to the list, too. Others, such as Colleen Dunn Bates, may be nothing more than hacks willing to invent a story or two in return for an envelope stuffed with cash. However, is this scenario plausible? Surely an operation of this nature would have been organised on a strict need-to-know basis? Regardless of the scenario, The Angell Foundation's president, Perry Oretzky, would have to be fully aware: as Angell's friend and CPA it seems likely he would have had a role in making financial and other preparations. Even if he didn't, it's literally inconceivable to think that someone who had a personal and working relationship with David Angell could fail to notice the visual discrepancies that appear in his own organisation's brochures and website. In the final analysis, who knows would depend on the reason for his disappearance, who arranged it and for what purpose. Was this an opportunist act on his part, a calculated decision to take advantage of the Flight 11 scenario and disappear for reasons entirely his own? If so, is this in any way linked to the financial irregularities surrounding Frasier? Or - and this has to be entertained given his active involvement with children's charities - to the child abuse scandal and cover up involving his brother, Kenneth Angell? Regardless, how could he have arranged his disappearance without foreknowledge of Flight 11's involvement in the 9/11 operation? I'm assuming, of course, that he actually had a choice in the matter, which may not be the case. There's lots of speculation here I know, but all the evidence appears to be pointing in the same direction. The bottom line is that I can think of no other good reason why the Foundation has altered these pictures in this way. Why didn't he elect to undergo plastic surgery and leave the photographic record untouched? Was this deemed too drastic a step, given that his face was relatively unknown prior to 9/11? The irony here is that with the exception of his 1984 and 1999 video appearances, his face only really entered the public domain in the aftermath of 9/11, following the release of these altered pictures to media outlets.